Steve Rattner makes some interesting points in this oped from the other day on how globalization has been pretty punishing to the real incomes of many in the middle class (“real” in that sentence is important—it means that even with the benefits of lower prices from the increased supply of goods, middle-income families have struggled—turns out people are not just consumers…they’re workers too…who knew!?). There are two things in the piece with which I’d take issue, though. Rattner—and he’s not the only one; I’ve heard this from lots of people—argues that given the decline in American manufacturing, we’re going to need to offset the damage of imbalanced trade with service exports. 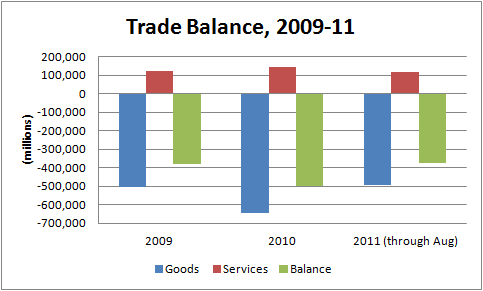 But as the figure below shows, that is a very tall order, given the difference in magnitudes between our trade deficits in goods which is much larger than our surpluses in services. Steve’s right to emphasize the benefits of service exports, but realistically, it will be many years before they can plausibly offset goods deficits. A better plan would be to boost both goods and services exports, and getting the exchange rate right on the dollar would help a lot in that regard. That strategy is important also because the folks who work in these two sectors—manufacturing and tradable services—have pretty different profiles, and we’ve got to worry the jobs prospects of those displaced from the factory sector. Share the post "Trade, Goods, Services, and Wages"
2 comments in reply to "Trade, Goods, Services, and Wages"
There is no way the US will ever be able to set the exchange rate to compensate for imports. Exchange rates are not a one sided deal. Creating an import certificate where importers would have to “buy” the right to import would be another idea to get low cost countries to pay up. Personally, I would just have the government spend the offset by directly creating good jobs. But that is way to simplistic. …seems the natives are restless & have gone off the reservation. Your chart is a perfect explanation for the current awakening. I’m afraid the conservative brotherhood is going to pitch a fit over this…they sense an impending collapse of the tea-vangelical tent. 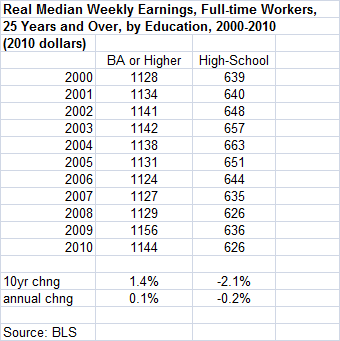 I would like to point out another impending implosion…the hoax that business creates jobs…hogwash. Consumers are the job creators, period. No consumer, no demand, no business…simple equation. Could be time for the whole lot of us to go off the reservation.